One amazing author and illustrator, 30 snow experts and 1830 pugs face smelly snow and peculiar perils on an epic illustrated race to the frozen north. Children in the Highlands were very excited when Sarah McIntyre turned up at their school in her refrigerated pug bus. Wearing colourful costumes and with her snow expert Professor Snowstorm in tow, she took them on an exciting adventure to the frozen north despite the sunny May weather! 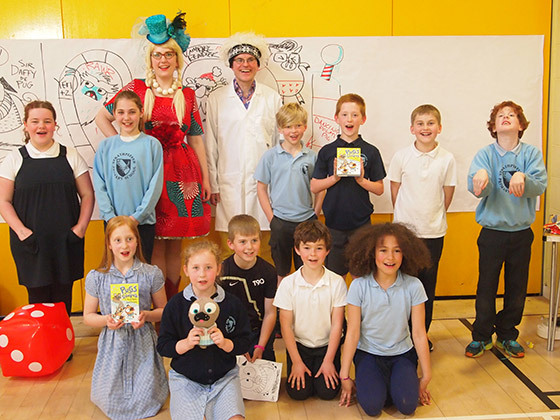 Over the course of a week this whistle-stop tour saw Sarah visit 10 primary schools, with another 11 schools attending sessions, sharing her passion for drawing and stories with over 1800 P4 – 7 pupils. Sarah explored her creative processes and read excerpts from her latest book Pugs of the Frozen North, before showing pupils how they can come up with ideas for their own stories, using a simple beginning, middle and end format. Sarah created and illustrated a board game with perils from her book and inspiring pupils to came up with some very inventive perils of their own! Pupils then had a go at drawing their own pugs to take part in the great race! The sessions were fun and inspiring, culminating in a frenetic board game between the pupils. The schools did some brilliant work to promote the tour. One school created a whole marketing campaign, making and putting up posters around their school, and delivering talks and readings from Pugs of the Frozen North to other classes. A huge thank you to Sarah and to all the schools we saw for a fantastic week! Congratulations to Beth Cowie from Caithness who won a signed copy of Pugs of the Frozen North in our Sarah McIntyre competition! 1830 pugs drawn by pupils.